Your personal yoga practice is tough and feels great. But sometimes, your tried-and-true yoga routine is more painful than "great." One of these times is, let’s face it, during your period. To help relieve that monthly pain, we reached out to a handful of yoga experts. They dished on the best poses and practices that help alleviate some of the discomfort periods cause. Period cramps and other monthly body aches happen because the uterus contracts the connective tissue and muscular infrastructure around the low back, hips, belly, and thighs. 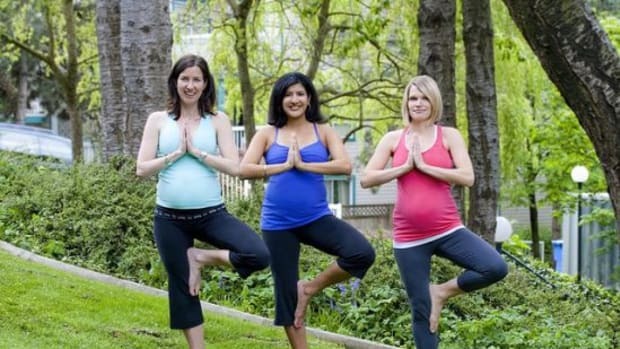 The body uses a lot of energy to cleanse itself, Ashleigh Sergeant, head of yoga content at Gaia.com, says. Day one and two of a woman&apos;s cycle are typically filled with bloat, pain, and body aches. If you wake up feeling terrible and don’t think you can practice, don’t. There are plenty breathing exercises to try. Claudia Matles, certified yoga instructor and wellness coach at the New York Yoga Pilates and Health Counseling by Claudia, suggests some gentle pranayama (humming bee breath), anulom vilom (alternate nostril breath), ujjayi (victorious breath), and deep breathing. Om Chanting is beneficial, too. Elle Swan, a yoga instructor based in Las Vegas, always emphasizes pranayama to her students. 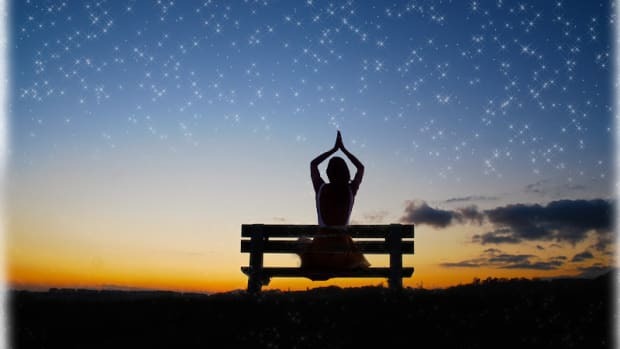 “During a woman&apos;s menstrual cycle, pranayama can ease both physical and emotional issues, especially when the focus is on belly breathing,” Swan says. “This type of conscious breathing stimulates energy receptors in the stomach that provide a sense of well-being to the brain," she says, noting that it can be done anytime throughout the day (on and off the mat) to help relieve menstrual pain and discomfort. 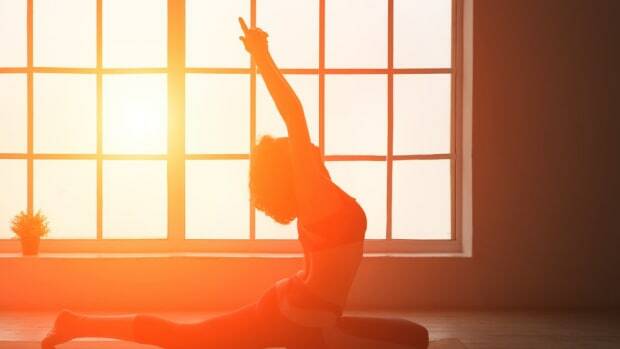 But if you think you can make it through a yoga session, stick to restorative poses, “letting go” postures, and other moves that help you feel relaxed. Also: Remember to pair yoga poses with your breath—even and full inhales and exhales. 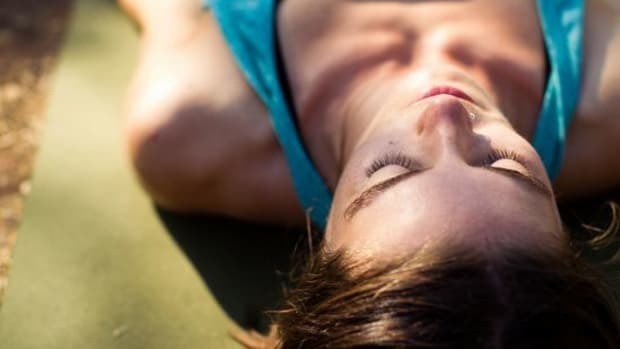 A combination of the Ujjayi and Falling Out breathing (pranayama) technique is best. Ujjayi should be used throughout your practice and Falling Out should be used in moments of peak pain, Brittany Szafran, owner and registered yoga teacher at Florida-based Sass Yoga, adds. Lay on your back, bend your knees, and place your feet on the floor. Let your knees fall out to the sides and the bottoms of your feet. It’s nice to put a block or pillow on the outside of each knee for support. Put one hand on your belly and one hand on your heart. Breathe long and deep. With each exhalation, let your inner groins release and relax. This pose is suitable for everyone. Sitting with your spine tall, stretch your legs straight in front of you. Open your legs wide. You don’t want to open them as wide as possible, it shouldn’t be a strain. If your low back rounds make sure you sit up on a blanket or firm pillow. Start to fold forward. Depending on your flexibility you may want to rest your forehead on a block between your legs or, if that is too much stretch you can use a chair and rest your arms and head on the seat. Take your awareness to your belly and your upper inner groins. Focus on allowing them to soften and release with each breath. This pose is suitable for everyone. It’s nice to have a pillow, bolster, or some kind of cozy cushion for this pose. Kneeling, sit back on your heels and separate your knees about hip width apart. Take a bolster or bed pillow and place the short end near your groin. Fold forward and sprawl yourself out over the cushion. Feel free to stack more cushions until you feel a nice, soft support under your belly and chest. You can lay your hands on your forehead to relax. This posture is super restorative, so allow yourself to sink in to it for at least 3 minutes. Enjoy long, deep breaths into your belly and womb. This pose is suitable for everyone. This pose provides a gentle compression to the reproductive organs to help stimulate, detoxify, and create circulation in this area. For many women, this can be incredibly helpful in relieving cramps both during the menstrual cycle as well as more preventatively between periods. Simply lie on your back and take your bent legs over to one side. This one should feel really pleasant. You can stay and relax for 3-5 minutes then switch sides. This pose is accessible to everyone. This pose is very helpful for women who experience cramps that manifest as low back pain during their periods. This pose supports the low back and provides a gentle release to the area. The key is making sure you can completely relax and stay for 5-10 minutes. This pose is accessible to everyone. This pose is incredibly helpful for women who experience the more traditional cramps in the abdominal area during their periods. The key to this pose is to use props under the knees so you can relax deeply. It’s not so much about feeling a stretch as being able to support yourself to relax. You can also use supports or pillows behind your back and head to make yourself more comfortable. This pose is accessible to everyone. 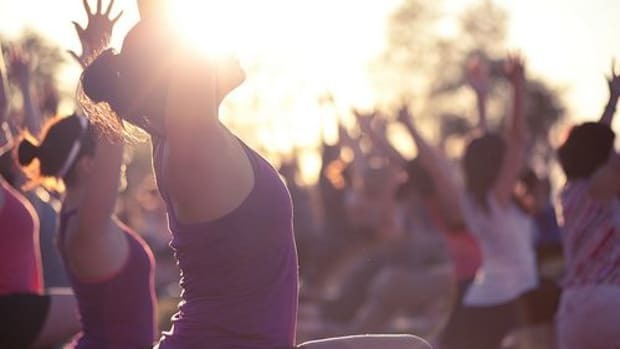 “If [students] are okay to do a full practice, they can warm up with a few rounds of cat and cow followed by some crescent moon sun salutations that will slowly prep them for heart opening postures,” Viso adds. Hip opening can feel nice to some students who already have open hips. Hip opening poses include frog pose, malasana squat, or pigeon pose (restorative with the bolster or regular). These poses are accessible to all levels. The smooth movement through cat-to-cow pose performed several times consecutively will aid in warming up the body. It also targets abdominal and back muscles. Lay flat on your back, raise your knees to your chest, and hold them in position. This “feel-good” position relaxes the lower back and abdominal region. Focus on your breath and release any built up tension throughout your body while freeing your mind of any anxiety brought on by cramping. This pose helps to decongest and open the lower back and pelvic area, as well as the hips, which can feel compressed during menstruation. It helps eliminate cramping and bloat. 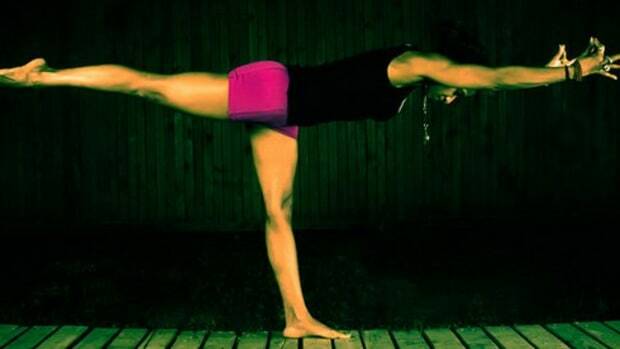 To modify, do the pose with two straight legs rather than bending the front leg. Although our bodies are exhausted when menstruating, it’s important to stand up (and bend over) after sitting or lying for long periods of time. Your body will thank you for getting the circulation moving to help relieve cramps. “I love to wrap opposite elbows and just allow any clingy thoughts flow down to the earth [during this pose],” Matles says. This is the best, go-to pose for alleviating menstrual cramps and bloating, Goldberg says. It’s a beginner&apos;s level pose and can be entered into with little to no prior warm-up poses. Lay down on you back with both legs extended out in front of you, close together on the mat. Lift your right leg up and bend the knee in toward your shoulder, grab just below the knee with an interlocked grip and pull the knee out and around the rib cage, into your shoulder, armpit. Elbows are kept close to the body, shoulders down on the mat. Hold for 30 seconds and release. This puts pressure on the stomach and compresses the descending colon, working to release gas and unwanted bloating, and helping with overall digestion. Repeat on the left side, which will also put pressure on the stomach, and compress the ascending colon, continuing to release gas and unwanted bloating. Finally, lift both legs and bend at the knees, grabbing for the elbows around the knees and pull the knees into the chest. Chin comes down close to the chest and the shoulders slowly come back towards the mat. Hold for 30 seconds. This will massage the transverse colon and compress the entire digestive system. “I would highly recommend hot yoga as opposed to regular, unheated yoga during your period,” Goldberg adds. 9 Natural Menstrual Cramp Remedies That Will Totally Change Your Life…Period!